Big kids love crafts, too! But with so much to teach and so little time, it’s important that any crafts we do in class have some educational value in addition to being fun. 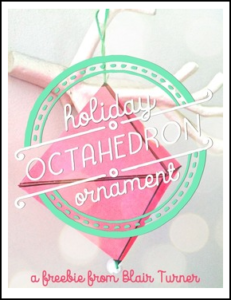 These Octahedron Ornaments are the perfect way to reinforce geometry and number concepts while celebrating the spirit of the season. Click HERE to check out all of my holiday and winter resources for upper elementary students!